I went down with my mate SS after procuring $9.95 fares from Tiger Airways soon after Tiger came into operation. SS and I figured “why not? It’s ten bucks and it’ll be a laugh.” We had heard many tales of beautiful scenery, excellent wines, fresh fish and chips, and a legendary (though sadly defunct) nightclub that had a slippery dip to take you between levels. Additionally we had a bunch of friends who’d lived in Hobart over the years and could recommend a few sights for us to see. On the first night we went to the Brisbane Hotel. We’d read in what could laughingly be described as “street press” that the venue was celebrating its first birthday. 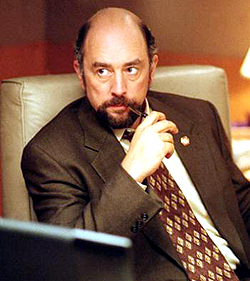 So it was pretty busy — and the DJ was the doppelganger of none other than Richard Schiff (better known as The West Wing‘s Toby Zeigler). SS and I made the best of it by hitting the piss and the tiles with fervent enthusiasm. We thought it was a bit weird that not a soul spoke to us. The Hobartians, apparently, can smell mainlanders. And DJ Toby Zeigler was not especially amenable to our requests that he play more Springsteen. The shoulder tapper, of whose gender I am unsure*, gave me the up-down and sniffed. “Yeah. that’s what you’d fucken wanna be saying” then disappeared into the night. I asked SS why she’d been in the ladies for approximately 72 years, and she explained that while she was in the queue to use the conveniences, a young lady had rushed into the loos and vomited down an unsuspecting patron’s back. SS wasn’t wearing her cardigan anymore because in a fit of selfless service she had donate it to the poor vomit victim. She’s great like that. A while later, I chanced a visit to the ladies myself. While I was waiting in the queue, I was verbally accosted by a woman who was in quite a state of indignant outrage. “Ya know what the farken problem is with Hobart?” she barked. “Is that right?” I asked with more than a measure of timidity. On our last night we were sitting in a cosy local pub just minding our own business and wondering why the Tasmanians had been not-especially-welcoming (read: no-one had hit on us all weekend) when a bloke strolled over and, without making eye contact, flung a coaster on the table with his phone number, and his name in inverted commas. “Col.” Then he left. We didn’t call. That was the last time I went to Hobart. I’m heading back tomorrow to attend a conference and pay a much-anticipated visit to MONA. I hope to return without being spewed on, snowed on or hit on. Wish me luck! *Of all the questions I wish to never be asked, “what gender are you?” is chief amongst them. I know, right. See you on Thursday!